Since it closed in 2008 the Café Royal has been redeveloped by architect David Chipperfield into a grand luxury hotel that extends up and out from its original premises to occupy the whole triangular block below Air Street. The restored hotel houses a great deal of history, the dining rooms and bars were where Oscar Wilde wooed Bosie, where David Bowie celebrated after killing off Ziggy Stardust, and where Princess Diana dined with friends. More than a century’s worth of statesmen and royals, and several generations of eminent journalists passed through these hallways and sat in these bars drinking absinthe and wine. 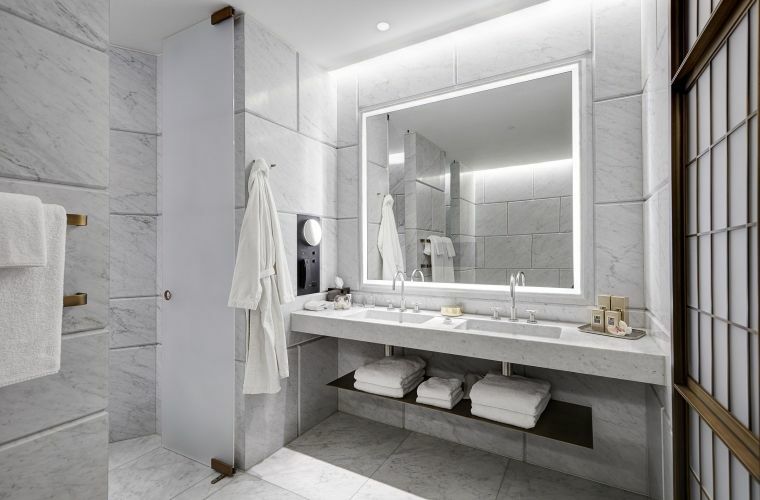 Chipperfield has deftly finessed the different floor levels of the hotels interconnected buildings, blurring their old boundaries. His signature minimalism stands in charming contrast to the listed gilt and endless mirrored walls of the original interiors. There are nice references and details; interior walls echo the pattern of the Portland Stone exterior; glazed panels around lightwells and some detailing of the rooms are fashioned from the same bronze as the face of Big Ben, glimpsed from the windows of the bedrooms and suites. Everything is spacious, full of light and generous, right down to the toiletries. From the bedrooms and suites you could look down over St. James' Park and the iconic skyline of Westminster or out through the side windows; all totally soundproof; and up the elegant John Nash designed Georgian curve of lower Regent Street Street’s grand Portland Stone terraces. When it comes to central London hotels, there’s central, and then there is the Café Royal, so central its as though it were surrounded by London. It is a staggering view wherever your room is, delightfully viewed from the huge and comfortable bed. It is a real treat to order a cooked breakfast to your room, which you can eat looking out on the statues of Piccadilly; and the slow dance of red buses and black cabs played out below that so vividly evokes images of London around the globe. There’s no shortage of dining and nightlife options, as well as a remarkably well-equipped spa and wellness center, and that’s just what sits in-house. 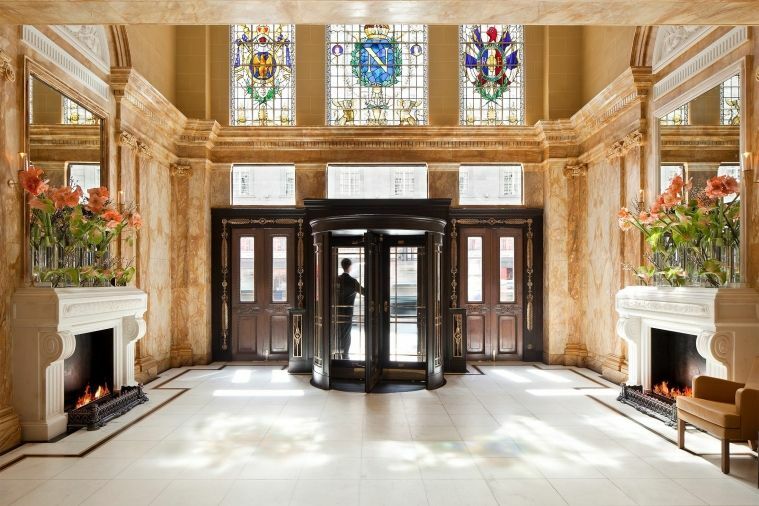 For a hotel with only 160 rooms and suites, the three bars, three restaurants and multiple lounge and dining areas provide an impressive offering for a central London hotel, that is hard to be equalled. The facilities on offer here are world-class and amongst the best of any London hotel. With the likes of Cecconi's, C London and Nopi a short stroll away, the Café Royal plays a neat trick of making some of the very best restaurants, shops and theatres part of the extended services of the hotel. It is a surprisingly peaceful stay to be enjoyed here, especially given its location. The service is friendly and diligent, aimed perhaps as most hotels are at business guests, but once you pass its unfortunate double entrance area that is currently something of a muddle, (I have been reliably informed by the Hotel that they have plans to reorder the ground floor area to solve this issue), beyond this one flaw, you will find an perfectly executed modern and luxurious hotel that reflects the history and culture of the city it is surrounded by.